$199 for 5000 Full Color Menus, Brochures, or Flyers. Two Sides 4/4, 8.5×11 100lb Thick Glossy Paper Stock. Call us Toll Free at 877-797-2177, in Florida. Provide us with a High Quality PDF, EPS, PSD, INDD of your Brochure. A PDF Color Proof will be Generated for your Review. Review and Approve your PDF Color Proof. Once Approved, We will then Prepare and Print your Menus or Flyer. 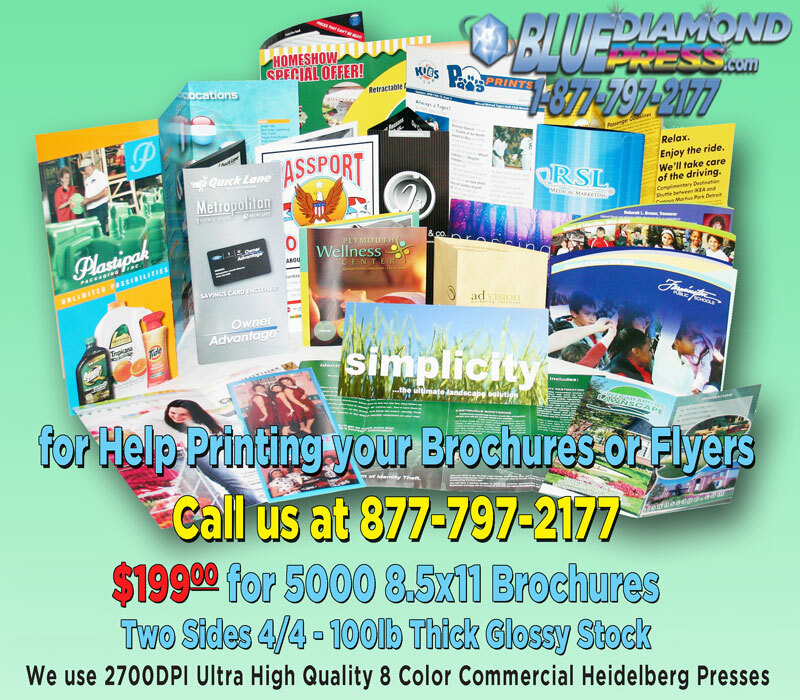 We use 2700 DPI – Ultra High Quality – 8 Color – Heidelberg Printing Presses. FAST, RESPONSIVE, and BEAUTIFUL !! We’ll provide you with the Best Price in Brochures Printing Period. Just call us, discuss with us your options, and we will provide you with unparalleled Service and Prices in town. Call us and we will design a Fabulous Brochure just for you ! Our Graphic Design Dept will compliment yours anytime. Your Brochure Printing Order is produced within 5-7 business days, and shipped as per specifications to your business. We use UPS to ship your Brochure Printing Order from Next Day Delivery to 5 days ground. Your order is covered and guaranteed. We guarantee that you will be happy with your Brochures, or we will re-print and re-ship your order free of charge. © 1996 - 2019 BlueDiamondPress.com Printing Services - All Rights Reserved.